The dramatic conclusion when the heroine gets a bit hot and flustered preparing pasta sauce. In the future, engineers have done away with doors and replaced them with lamprey mouths. Even allowing for perspective (and silicone), her head and left arm are bigger than the rest of her. And I’ve had the ‘Waaaah! Bodyform’ jingle running through my head since I saw this. @anon: behold, this is why we need space lingerie merchants! I see-ah the diadem-ah, but I don’ta see-ah no saga. Looksa rather perky-ah. On an unrelated offensively stereotypical free note, she seems to be quite the slasher, by the looks of her knife. You might very well want to think twice before ogling her implants. Aw, leave Aletys alone. She’s just butchered her cousin. Give a girl some…space. @DSWBT: Savvy entrepreneurship it is, then. Although, I can’t help thinking the young lady would be better served by other types of quality clothing, seeing as her shirt isn’t staying closed and her jacket has lost so many buttons. Maybe she just came back from showing the tailor what she thinks of his/her professional skills before the sleeve falls off as well. 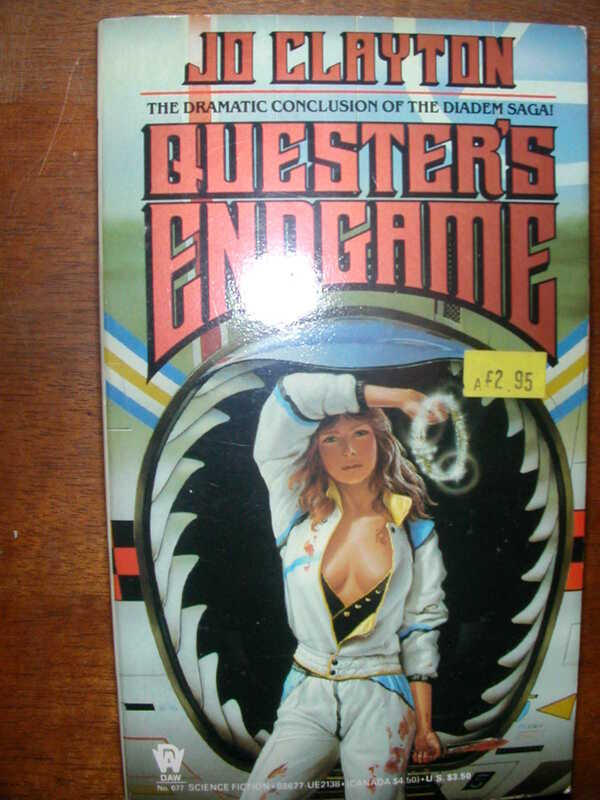 I guess “Ender’s Questgame” would have brought legal troubles. Oh no, are they doing a reboot of ‘Fargo’?? Is there a half-hearted attempt at a ‘ting’ there? And what’s she questing for? Better support? Is this one of those carnies that Austin Powers is so scared of? RE: Anon’s “Ender’s Questgame”… yeah, this title is like one of those products that sound almost-but-not-quite like the premium product — or the items that sound almost as if they were eco-friendly but they’re really not. You remember that episode of “Firefly” where Kaylee got all flustered because she couldn’t get any action from Simon so she knifed him instead…? Yeah, neither do I, but I suspect it would have looked a lot like this.